For decades now, politicians have been arguing about which party is better for stock returns. Leading up to the 2016 Presidential election, the argument was made that the stock market does better with a Democrat President than a Republican President. After the 2016 election and the subsequent stock market appreciation, the argument has been made that Donald Trump as President will be great for U.S. stocks. Republicans are perceived to be the party of big business. 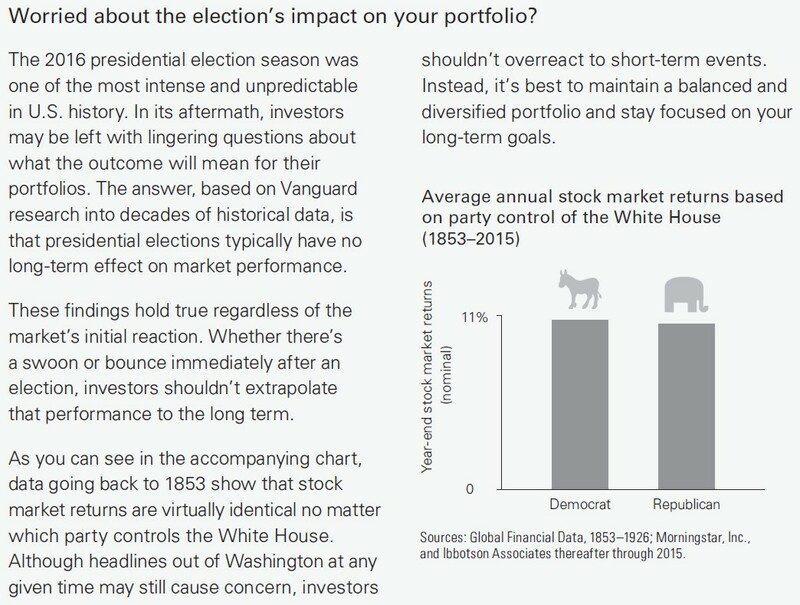 If Democrats can show that electing a Democrat to the White House correlates to better stock returns, they believe that they can negate some of the Republican appeal. With the deep political divide during the 2016 Presidential election, statistics surrounding this issue have been widely quoted with vehement certainty. First, you can define “the stock market” in many different ways, each of which will lead to different results by changing the pool of data analyzed. Some use the Dow Jones Industrial Average (DJIA), which currently is just 30 large-cap stocks but was only 11 stocks in the early 1900’s. Others use the S&P 500, which is limited to just U.S. large-cap stocks. Both omit mid-cap and small-cap stocks. Next, you can define a President’s term either from election to election using the second Tuesday in November or by the January 20th Inauguration Day. Since the markets anticipate movements, do we credit the drop at the end of 2008 to Obama or George W. Bush? Is the appreciation after Trump’s election better explained by hope about his presidency or lingering gains from the Obama era? Finally, you can cherry pick your starting date. Start with Herbert Hoover’s Inauguration on 3/4/1929, measure by the DJIA and Republicans will begin with four years of an annualized return of -35.6%. Or put another way, after the Hoover administration, Republicans start with an 82.8% decline. Start six years earlier with Calvin Coolidge on 8/2/1923, and the Republicans will at least receive six years of 25.5% annualized returns. While economic freedom is correlated to economic growth, the effect is much more complex than which political party occupies the White House. Nixon was a Republican but instituted wage and price controls, market interventions that are decidedly not in line with limited-government principles. On the other hand, Bill Clinton worked with a Republican Congress to pass some some very atypical laws for a Democrat. Every President inherits decisions made by prior administrations. George W. Bush took office just before the technology bubble was peaking. He also inherited the Consumer Reinvestment Act passed under the Clinton Administration which ultimately resulted in the financial crash of 2008. Not every event that occurs during a President’s tenure can fairly be attributed to that President’s policies. Perhaps returns should be offset by a certain number of years? Ronald Regan had to break the back of inflation and suffer a recession before the economy could start growing again. Additionally, stocks average 6.5% over inflation. That means if you were to do the study correctly, you would account for inflation and compare real returns. No studies actually factor out inflation. Therefore Presidents who serve during high inflationary times seem to experience higher average annual returns even though those returns do not increase actual spending power. The best performance was when the nation had a Republican president with a Republican-controlled Congress. That was followed closely by a Democratic president facing a Republican Congress or split Congress. No matter which party controls what branch of the government, the livelihood of millions and millions of Americans working for publicly-traded companies depends on those workers finding a way to make a profit. Politics matters less to our financial success than the ordinary decisions we face every day of living within our means and saving and investing in the markets. Tax records show Republicans overly generous, Democrats excessively stingy. Should We Wallow in the Rising Stock Market?